T’was a glorious day in New York City as I strode purposefully across newly mowed expanse of our Green Beach. I bumped into Jill and Clare E. Fresh on my way in and made a donation to the latter’s fundraising for a partner school in…in…Malawi? Dang, I should remember that. Anyway, I was happy to see (not so) Young James, Robbie Rob, and The Oracle in one Jam, and Fresh, (not so) Young Daniel, and Jimmy Dodelson, in from the Left Coast, in another. It is always great having folks return to their old stomping grounds. James, Rob, and Joey were tearin’ it up, while Fresh, Daniel, and Jim were hanging right with them on the Heiniosity Scale. I Love All*Star Thursdays. I was especially tickled to see our pair of (not so) Young ‘uns back together again. Daniel has been just crushing it, with a win at the Virginia States (Congrats again to Sir Randeth and Mr. O’Neill) for validation. And James was all over Europe, behaving Shredfully wherever he went. Those two had Mr. E. Fresh and Robbie-Rob swingin’ for the fences, with “Farmer SAID…Get Out of the Way!”, the new Freshian catch phrase ringing through the air each time (NSY) James went charging after the plastic. He knew that his Tribal time would be limited, so he offered no argument when I proffered the Yella Jersey. The Board made it clear on his departure that being in Prague would be no excuse for missing an All*Star Thursday. After Jimmy took a break for water, he invited himself into a Jam with Rob and The Oracle. Legend has it that Jim is the “Original” Jam Buster, though like any of the Ray’s Pizza shops in NYC, I believe that is a franchise that has many a starting point. In any case they got nice for a bit, then he sat and I subbed for him. Robbie Rob was running on fumes after many Jams and he too went for some refreshments. That left The Oracle and I alone, but not for long. TedShred and (NSY) James joined us, and things got pretty hot. It did not quite make it to 11, but some pretty cool stuff happened. Joey hit a Gitis off of my Tea-Bag pass, TedShred hit a Double-Spinning Gitosis, and James did all kinds of Zany &$%&^%$ before sealing with an Olivia. S’NICE!!!! The most remarkable thing about our sport is how tough it is to do well and how the most incredible combination doesn’t mean s*** if it ain’t properly sealed. There were several hot co-ops and combos that had us on the edge of insanity, but alas, the Girl exited the vehicle each time. That didn’t slow us down though. James and Joey eventually cycled out, but Dougie said “Ahm Comin’ Down!” bringing his special brand of step-it-up to the Jam, and Kevin joined in as well. Wait, is that Lou walking in with TLC??!! Sadly, it was not…no such luck! Anyway, the sun below the horizon and the Parkies were barking at us to exit to the West forthwith, without delay when I sealed with a Triple-Fake after Ted-Shred’s Scarecrow and Kevin’s Hein combo. The Jams were so much fun that I didn’t even have one tasty beverage. I do believe that was a first and hopefully the last time that happens. That’s all for now, but next week we’ll talk about the Invisible String screening hosted by Robbie Rob. Kudos to Michael and the Boys! 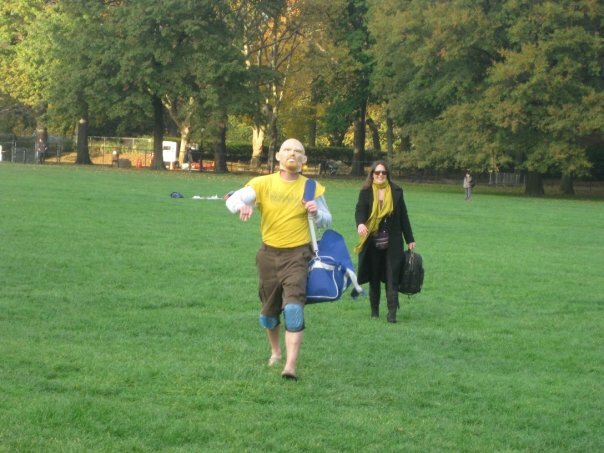 This entry was posted in A*T Chronicles - 2012 and tagged Freestyle, Frisbee, Invisible String, New York, Sheep's Meadow, sports. Bookmark the permalink.